Genesis 23 begins with the sad news of Sarah’s death and Abraham’s mourning for her. Yet most of the chapter is taken up with the story of Abraham’s securing a place to bury Sarah. As a resident alien in Canaan, he did not own property and, therefore, lacked a suitable burial site for his wife. Verses 4 through 16 of Genesis 23 describe the process of negotiation by which Abraham purchased a small field where there was a cave for Sarah’s burial. This process, which seems peculiar to contemporary readers, reflects the particular laws and practices of the Hittites, with whom Abraham did business. In the end, Abraham was able to buy a field from Ephron the Hittite, and that’s where he buried Sarah. As I think about this story, I’m struck by the fact that Abraham finally owned a small piece of the land that God had promised to him. As you recall, Abraham had left everything to go to that land. Yet, during his lifetime, he was only a stranger and foreigner in the land that would one day belong to his progeny. So when his wife died, Abraham had to buy a place for her burial so that he could be sure her body would be undisturbed in the future. How ironic that a small field with a cave for burial is the only bit of the promised land Abraham ever owned during his lifetime. Though living in light of God’s promise of land, he owned only a very small bit of what had been promised to him. In this way we are rather like Abraham. No, God has not promised literal land to us. But we do have his astounding promises: a new heaven and a new earth; no more tears, death, sorrow, or pain; living in God’s obvious presence forever, and so on. During our lives on this earth, however, we actually experience only a bit of what is promised to us. The new creation has come (2 Cor 5:17), but only in part, as we live our lives in light of God’s grand and glorious promises. The analogy between Abraham’s possession of a bit of land and our possession of a bit of the future breaks down when we think of how we acquire it. Abraham purchased his plot of land, fair and square. It was not a gift. We, on the contrary, do not purchase our present experience of future blessings. Rather, it comes to us by grace, a gift from God through Jesus Christ and the indwelling power of the Spirit. How do you think Abraham might have felt when he purchased a bit of the land that had been promised to him? How have you experienced in your life something of the life of the future? Gracious God, we have so much to look forward to when it comes to the future. One day there will be a new heaven and a new earth. That will be a time when your justice reigns and your peace prevails, a time when, individually and together, we are fully the people you have made and saved us to be. How we look forward to that time! In the meanwhile, you allow us to experience in small measure what is yet to come. We still wrestle with sin, yet we know the comfort of your forgiveness. We still live in a world tarnished by injustice, yet we sometimes see when your justice is actually reflected in our lives. We still don’t know you as we will one day, yet we are blessed to know you truly through your revelation to us. We still live in a world twisted by hatred, but sometimes we experience genuine love as your gift for us. Thank you, Lord, for the hope of the future and for the encouragement that comes when we possess a bit of that future now. Amen. 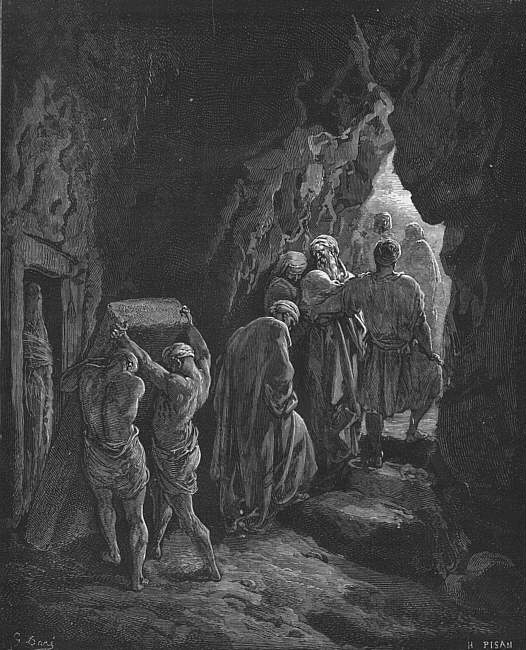 Photo Credit: “Burial of Sarah” Gustave Doré. Licensed under Public Domain via Commons.